Besides setting a fleet of driverless cars out onto the streets of Pittsburgh (we’re growing to trust them! ), Uber appears to live up to its statement with the inclusion of accessibility features. Hard of Hearing? No Problem for Uber. 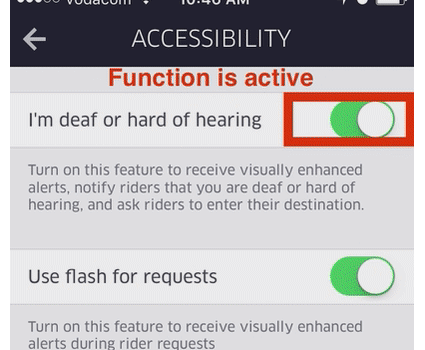 Show a message to let riders know the driver is deaf or hard of hearing. Widely-known companies that provide features like this pave the way for inclusion in our workplaces, our tech, and even our social interactions. Where it could have been easy for Uber to just encourage diverse hiring, they identified an opportunity to actively welcome capable drivers who are hard of hearing by ensuring their experience, and the experience of those drivers’ riders, is the best it can be. This is what the Dignity & Respect Campaign’s Lead the Way initiative is truly about: recognizing and promoting our companies, institutions, communities – and apps! – who support the potential of ALL and treat others with dignity and respect. You don’t have to be Uber to make a difference. Dignity and respect can start anywhere, big or small. How can your organization can help to make the world a better place? Learn more this Uber accessibility feature here.